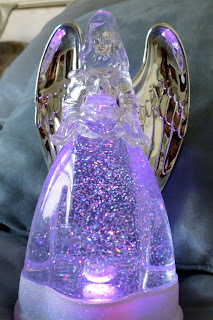 A friend gave me this battery operated Angel lamp. The sparkles and the water inside the robe change with the color rays shining through it and reflecting on the silver wings. My inner child loves to watch the Angel transform into beautiful rays of lavender, green, blue, yellow, pink, red, and crystalline. I find it has a calming influence, like watching fish swim in a tank. 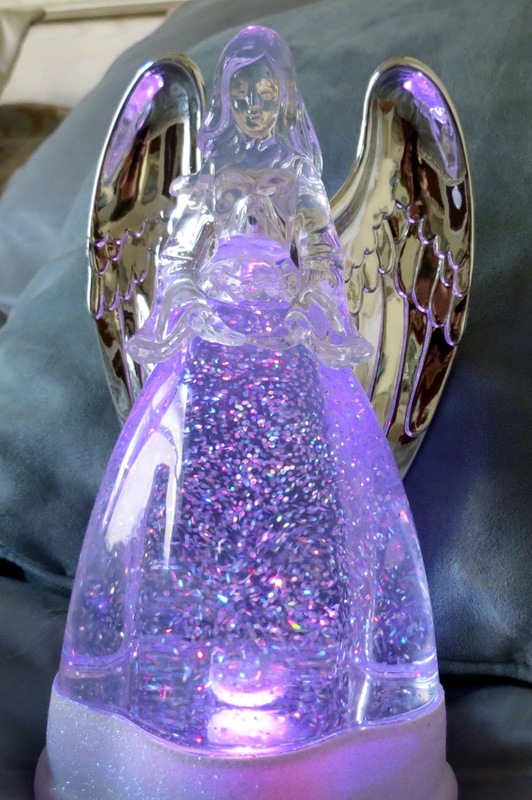 The Angels work with seven different color rays, each representing a particular virtue. I will be writing more about this later in the week. Angels often appear in an image that we'll recognize as an angel, e.g., human-like, with wings and a halo, and a long robe because that is our concept of what an angel is supposed to look like. Otherwise we would not make the connection that this is an angel. Some people with a gift of vision comment that they see angels in images that are less human in form and light filled. Sparkling lights made up of billions of light specks in a vague outline with an intelligence, like a wise ancient being, who is available as a companion. It is wonderful to know that the angels always interact with us in a way that we can understand. We don't have to see, we don't have to hear, we only need to stay open to being shown in whatever way is appropriate for us. The intention and the open heart assists the fulfillment the most.